We hope you enjoy this collection of 10 dessert recipes, any of which would be nice to serve to your family and guests. From Classic Carrot Cake and Lemon Chiffon Pie to Sweet Potato Pie, you're sure to find something you will enjoy. A quick and easy lemon dessert bursting with lemon flavor. The perfect ending to a meal. Sprinkle gelatin over water and lemon juice in a small saucepan; let stand 1 minute. Stir in Splenda Granulated Sweetener and cook over medium heat, stirring constantly, 2 minutes or until gelatin dissolves. Stir in lemon rind and lemon extract. A great classic dessert and it has less carbs. Preheat oven to 350 degrees F. In medium bowl whisk together flour, baking powder, baking soda, salt, cinnamon, and allspice. Set aside. In small bowl whisk together egg whites and eggbeaters. Set aside. In large bowl beat Splenda Granulated Sweetener, margarine, honey, vanilla, applesauce, and canola oil. Mix in egg mixture, stir until well mixed. 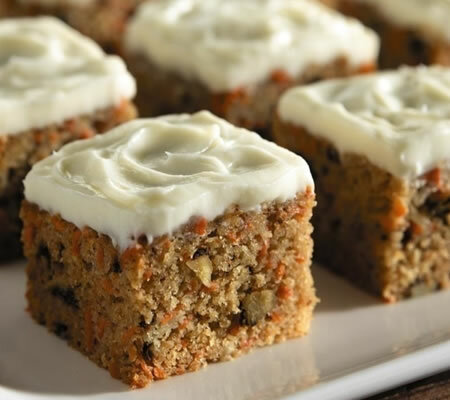 Stir in flour mixture, then carrots and walnuts. Pour into greased 8 cup loaf pan and bake for 40-45 minutes, or until toothpick inserted comes out clean. Allow to cool, ice if desired. Yield: 8 servings Serving size: 1 slice. Preheat oven to 350 degrees F. Spray an 8x8 inch metal cake pan with vegetable cooking spray. In a small bowl, stir together flour, baking powder, baking soda, cinnamon, and ginger. Set aside. In a large mixing bowl, beat margarine and molasses with an electric mixer on high speed for approximately 1 minute. Add egg substitute and vanilla and blend on high speed for 30 seconds. Mixture will be liquid. Add Splenda Granulated Sweetener and beat on medium speed until very smooth, approximately 1 1/2 minutes. Add flour mixture and applesauce and beat on low speed until mixed, approximately 45 seconds. Spread batter evenly into prepared pan and bake for 30 minutes at 350 degrees F.
This simple-to-make coffeecake, with it's apricot, cinnamon and nut filling, has all the richness of full fat and the taste of sugar. For Walnut Filling, combine 1/2 cup apricot preserves, 3/4 cup Equal, cinnamon and nuts in small bowl; set aside. For Coffeecake, combine baking mix, 2 cups Equal and cornstarch. Add remaining ingredients, mixing until smooth. Spread 1/3 of batter in well sprayed 9 or 12 cup bundt pan. Spoon half the Walnut Filling over batter. Repeat layers, ending with batter. Bake in preheated 350F oven 40 to 45 minutes or until coffeecake is browned on top and wooden pick inserted in center comes out clean. Cool in pan 10 minutes. Invert onto rack and cool. Spoon 1/3 cup apricot preserves over top of coffeecake, if desired. Serve warm. Mix crust ingredients together, and press into a 9-inch springform pan. Place pan on a baking sheet and bake for 10 minutes. Remove from oven and cool to room temperature. Reset oven temperature to 325 degrees F.
Beat cream cheese and Splenda Granulated Sweetener together until well mixed and smooth. Add eggs, egg whites, cornstarch and salt. Mix until smooth. Add sour cream and vanilla; mix until well blended. Measure 1/2 cup of the cheesecake batter and pour into a small bowl. Add instant espresso crystals and cocoa mix. Stir until well combined. Pour half of plain batter over crust. Top with half of the coffee batter by placing rounded spoonfuls over the cheesecake batter. Gently swirl the coffee batter into plain batter with the tip of knife or spatula. Repeat with remaining batters. Bake 45-50 minutes or until center is almost set. Remove from oven and gently run metal spatula around rim of pan to loosen cheesecake (this helps prevent cracking). Let cool 20-25 minutes before covering and placing in the refrigerator. Refrigerate 4- 6 hours or overnight before serving. Line 12 muffin cups with paper liners. Place one cookie in each paper cup. Set aside. Mix coffee granules and water in large bowl until coffee is dissolved. Add SPLENDA Granulated Sweetener, cream cheese spread, vanilla and cinnamon. Beat with wire whisk until well blended. Gently stir in whipped topping. Spoon evenly over cookies in muffin pan. Top each cheesecake evenly with raspberries. Cover and freeze for 3 hours or overnight. Remove from freezer about 10 minutes before serving to soften slightly. Dense wedges of chewy chocolate are paired with a sweet coffee-flavored cream and fresh berries. You can watch a video of this recipe being prepared here. Preheat oven to 325F. Coat 9-inch, nonstick springform pan or cake pan with canola oil cooking spray. Combine flours, cocoa and baking powders, 1 tablespoon coffee granules and salt in medium bowl. Combine sugar, canola oil, egg substitute and vanilla in another medium bowl; mix well. Add sugar mixture to flour mixture, and stir until just blended. Batter will be very thick. Spoon into bottom of pan; spread evenly by coating the back of a spoon with cooking spray. Bake for 11 minutes or until slightly puffed. (Mixture will not be completely cooked at this point, but it will continue to cook while standing without overcooking and drying out.) Place pan on a wire rack, and let cool for 5 minutes. Remove sides of the pan and gently remove from bottom or leave on bottom and place on a serving plate. Serve warm or at room temperature. When cooled completely, store in an airtight container at room temperature. To make cream, combine water with 1 teaspoon instant coffee granules in a medium bowl, and stir until dissolved. Add whipped topping; whisk until a sauce consistency is reached. For thinner sauce, add 1 to 2 tablespoons water or milk. Refrigerate until needed. To serve, cut into wedges, spoon mocha cream on top, and sprinkle with berries. Light and creamy cheesecake bars topped with toasted almonds. Spray an 8x8 pan with non-stick cooking spray. 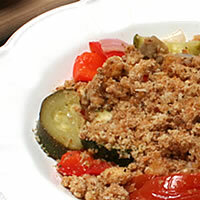 Mix crust ingredients together in a mixing bowl. Mix well. Press into prepared pan. Bake 10-12 minutes or until firm. Mix cream cheese and Splenda Granulated Sweetener together until smooth. Add eggs, one at a time, scraping the sides of the bowl, and mixing well after each addition. Add sour cream and extracts; mix well. Pour over prepared crust. Bake in preheated oven for 40 to 47 minutes, or until firm. For Pie Filling, roll pastry on floured surface into circle 1 inch larger than inverted 9-inch pie plate. Ease pastry into plate; trim and flute edge. Pierce bottom and side of pastry with fork. Bake in preheated 425F oven 10 to 12 minutes or until pastry is golden. Cool on wire rack. Combine water, lemon juice and cornstarch in medium saucepan. Bring to a boil over medium-high heat, stirring constantly. Boil and stir 1 minute. Beat eggs, 2 egg whites and lemon peel in medium bowl. Mix in 1-1/2 cups Equal. Stir about half of hot cornstarch mixture into egg mixture. Return all to saucepan. Cook and stir over low heat 1 minute. Remove from heat. Stir in butter until melted. Stir in food coloring, if desired. Pour mixture over baked pie shell. For Meringue, beat 3 egg whites in mixing bowl on medium speed of mixer until foamy. Add cream of tartar. Beat to soft peaks. Gradually beat in 2/3 cup Equal, beating to stiff peaks. Spread meringue over hot lemon filling, carefully sealing to edge of crust to prevent shrinking or weeping. Bake pie in 425F oven about 5 minutes or until meringue is lightly browned. Cool completely on wire rack. Cut pie into wedges. Roll pastry on floured surface into a circle 1 inch larger than inverted 9-inch pie plate. Ease pastry into plate; trim and flute edge. Set aside. Blend sweet potatoes in mixing bowl on medium speed of mixer until smooth. Stir in eggs, Equal, flour, lemon juice, vanilla, spices, salt and evaporated milk. Pour mixture over pastry shell. Bake in preheated 400F oven 40 to 45 minutes or until filling is set and sharp knife inserted into center comes out clean. Cool pie completely on wire rack. Cover and refrigerate. Garnish top of pie with whipped topping and grated nutmeg, if desired. Cut pie into wedges. Credits: Warm Brownie Wedges With Java Cream appears courtesy of Chef Nancy Hughes, and is excerpted from "The Heart-Smart Diabetes Kitchen: Fresh, Fast and Flavorful Recipes Made with Canola Oil." Sweet Potato Pie, Lemon Meringue Pie, and Apricot-Walnut Swirl Coffeecake appear courtesy of Equal. Lemon Chiffon Pie, Almond Cheesecake Bars, Frozen Cinnamon-Coffee Mini Cheesecakes, Chocolate Mocha Cheesecake, Classic Carrot Cake, and Applesauce Cake appear courtesy of Splenda.